Directly connect the LightSaver Max (LSM) to my Yaesu FT817ND for extended portable Amateur Radio operations, additionally allow charging of my mobile phone, my 7in android tablet used for logging in the field along with assorted miscellaneous charging such as GoPro for recording, my headlamp for night operations etc. Please note these are not combined or simultaneous use calculation but individual single item calculations. Conclusion: as per the video the LSM performed brilliantly. Delivering a smooth quiet 12.2v for over 2 hours of use, plus charged my phone and tablet to get the battery down to 6/10. I had itchy feet again and wanted to get out to activate a summit a tiny bit further afield than VK1 easy walk ups, Mt Gillamatong near Braidwood in regional NSW seemed to fit the bill nicely. A warm easy 1 hour drive east of Canberra and 10m from down town Braidwood - Gillamatong as looks rather imposing from the base. We approached from the west near the local water treatment facility. This apparently is not the way others have in the past, however is the easier of the East / West approach options. Progress on the dirt track was momentarily halted by the appearance of a rather slippery character - a rather well fed Red Belly Black Snake quickly moved off in search of a less disturbed hideout and we passed on. Activation side of things were only undertaken for an hour or so with no nibbles on 2m or 70cm sadly. HF seemed to be ok with my regular bands of 40 and 15m yielding results. Below is a video of the activation. Catch the Sun! Store the power! I seem to have developed a bit of a fetish for batteries. Any one that knows me or reads this blog knows that I love my gadgets. I have specifically designed all of my kit to either be charged by solar (the Goal Zero Guide 7) or via USB. Rising before the sun, seeing it rise over the hills, covering all it touches is golden highlights is amazing at the best of times, couple that with the brilliantly vivid scenes of gently glistening dew covered rice growing in the field – its simply magic – simply Myanmar. While in Kalaw, staying at our early 1900’s bed and breakfast, we could not turn down a change to walk in the rural countryside. What better time than early morning. Our guide assured us the night before that the terrain would be ‘gentle’ and ‘down hill’. I think today must have been Opposite Day since 7 of the 12km was up hill rising to 1404m above sea level at the high point. By not means was the walk hard, just unexpected. The villages that we passed and their inhabitants live a truly rural existence. Every second house had a water buffalo in the front yard, who received a loving pat as the families departed, walking their a small children heading off to school. During our visit, the children were heading off to school on the last day before a 10 day break. Which means after cleaning the school grounds they were free to go home which they were doing when we dropped into the local school at around 930am. As the villages are totally devoid of mains power, every house had a solar panel for lighting during the dryer months and a mini hydroelectric setup in the local stream for during the monsoon season. Our guide even showed us the roadside local herbs that the farmers use for first aid – one to stop nose bleeds, which when burnt also keeps the squadrons of local mosquitoes at bay, another that you put the sap on cuts and scratches to seal against dirt. During out time in Kalaw & Inle Lake a number of internal bombings occurred throughout Myanmar, the Australian Department of Foreign Affairs (DFAT) has emailed me a few travel advisory updates informing us that a number of explosive devices have been found across the country. Detonations have been confirmed in Yangon and Shan state ( the state we are in now). While the information is most welcome, it will not be effecting our plans, but I will be keeping a ‘weather eye’ on the situation. A short hike you say..
During our time at Mt Kyaiktiyo Frankie suggested a ‘small’ hike to a neighboring village where some pre Buddhist ‘Nat’ spirit idols are situated in the hillsides. The small village, Kyait Htet Gyi (pro.Jow Chat Gee) is tucked away from visiting foreign tourists, approx. 1-hour hike straight down the mountain along a dirty maintain track. The monsoon season has not been kind to the Kyait Htet Gyi area. Situated along a ridgeline on one side of Mt Kyaiktiyo in the region near the Myanmar border, which is home to Karen (pro. Car En) people, which are a Burmese Ethnic minority and to the east is Thailand. Frankie struck up a conversation with him in Burmese and he offered to be our guide in exchange for us buying a drink from his little house stall. Today he was taking the trip to deliver goods to the small path-side stalls in preparation for ‘festival season’ and the newly constructed stalls. The trip normally took him 35-45 mins. With us novices it took over an hour. He also kindly took us to his main source of income – his stall. We met his little daughter and son both aged less than 5yo along with the business manager – his wife. When not carrying goods they all live in a small space behind their stall measuring no more than 5m x 5m constructed of bamboo, thatch and tarps. Frankie purchased all the children little packets of chips.. the cautious smile that appeared on all faces was priceless. In fact we approached one fork in the path our ‘accidental’ guide pointed out the path to Thailand. Almost at the end of the trail our guide took us down a small washed out landslip to a small ‘Nat’ temple for the ‘Mother of Dragons’ who guard the mountain. The Game of Thrones reference was not lost on me and brought a little smile to my face when Frankie translated our guide’s explanation. Further at the end of the trail was another rock that is similar to ‘the golden rock’ only, not golden. The rock is balanced precariously on the side of a cliff just like is more famous cousin. The elders of the village that also look after the temple space told us that each year they travel to another village to collect a long thick vine that is climbed by a designated village member to place donations of gold leaf and adornments on the top. If the walk down to the village was not harrowing enough… the walk back – all uphill was certainly a challenge. We had been planning a trip to see Mount Kosciusko during the off ski season. March 15th was that day! The day was a ‘little’ windy – once we cleared the top chair lift from Thredbo to the “Eagles Nest” we were greet with a temp of -1 including wind chill and 50-70km/h winds. I will let the video speak for its self, but the day was great. I kept telling Frankie “ This is the highest mountain in Australia, it is not meant to be easy” As you will see in the video we did not make the true summit due to the weather – good call – within 30 mins of reaching the base and getting in the car, it absolutely bucketed down – that plus wind and -1 temps? Hmm no thanks. To keep the cold out – what is better than a cup of tea in nature – nothing I say – nothing at all and the JetBoil really came through. I wanted to publicly acknowledge the amazing customer service I recently received from The Kit Bag, an online kit store from Western Australia. While I was in Darwin last year for work, I needed a new every day pack, I settle on the 36l Bravo Recon from The Kit Bag. These guys know how to look after people!! Located approx 50km south of Tuggernong ACT in the Namadgi National Park in the Naas Valley.Getting thereFrom Point Hutt Crossing and through the township of Tharwa, keep heading south. Road is tarred until approx 15km north of the turn off to Mt Clear Campground. Trailhead is located adjacent to the Mt Clear Campground. The real stand out of the trip would have to be the location. The track was well sign posted along with being well looked after. Bother huts were well appointed for their age (dating from 1940s). Both huts along the trail had a full and clear corrugated iron rain water tank along with brick fireplace. The addition of the fly mesh face veils really lowered my frustration level at flies trying to get into my mouth and climb on my face as I was sweating, while walking around. The Tent- firstly it was very small, even with the tiny weight I did not expect to be sleeping shoulder to shoulder. We are both not very tall ( Frankie is 180cm and I am 172) and there was not much room below us feet wise that was not being used. Additionally on the left hand side at the head end, the fly did not come down low enough to cover the mesh body by about 4-5cm. There was no rain the night we camped but there was a heavy dew that is common with warm days and cool nights. From the location of the moisture I can tell it was not condensation. Moisture was coming through into the mesh body from contact with the fly exterior. Every guyline was tight along with every peg point – the tent could not have been tighter. Simply it is going back to Kathmandu. The lighter – CountyComm Tiny Split Pea Lighter. It is part of my carry every day kit as my emergency firelighter. No matter how many times I fill it with zippo fluid it is dry when I need it – BINNED. Delorme InReach – As a tracker it is brilliant, as a message sender it is ok, as a message receiver – CRAP. As per the video – there was some dark dark clouds hanging around so I messaged my friend back in Canberra to see on the weather radar if some nasty weather had blown in. He received my message within minutes and replied in a short period of time – yet still by the next morning nothing was received. Additionally while the tracker has ben running on the same set of batteries for over a year, the warning from full battery to shutting down is a tiny red flashing light with less than an hours warning – hard to know you are no longer tracking with only an hours notice. The pack – the light padding on the shoulder straps is a little annoying as is the velcro ripping sound when you are putting the pack on while full as the height adjustable rotating hip belt sorts its self out. The water – the huts have a great supply of clean fresh water. While it is always good to plan to carry extra, knowing there was some available would have mean the 4lt (3 in the Camelbak bladder and 1 in reserve Naglene bottle) could have been adjusted.When we got back to the house I weighted my pack after eating all the food and drinking most of the water – 12kgs. Too heavy so will start shaving weight. Well we are home now, after out overnight camping adventure in the Naas Valley and walking up to the Horse Gully Hut. Overall it was roughly 20kms round trip. I weighted my pack when we got home and it came in at 10.7kgs with 900g still in my water bladder.. I can assure you that is rather a load when you are climbing up hill and down dale. Have a watch and tell me what you think. Since being back from Myanmar and Darwin I have been looking to do more bushwalking and day hikes. 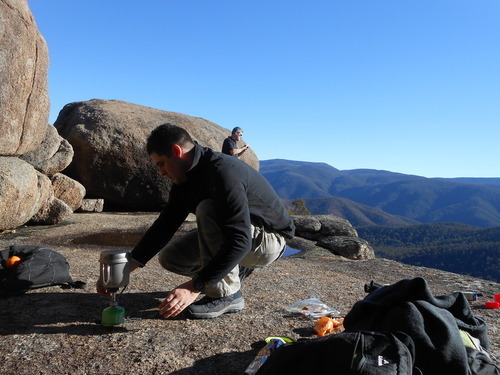 I have also discovered the Namadgi National Park. I know it sounds silly to say I have just discovered it after living in the ACT for nearly 10 years, however I am glad I have. Namadgi sits about 40kms to the south of what most people think of as the bottom of Canberra, Tuggernong. Namadgi actually takes up around 46% of the area of the Australian Capital Territory. 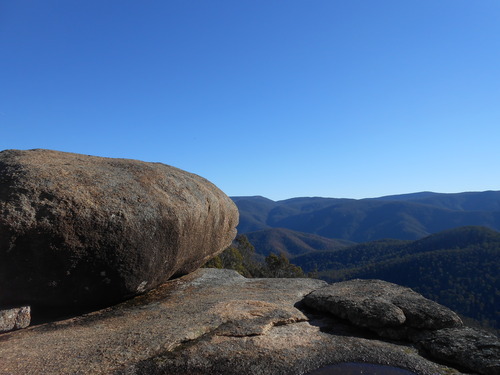 A few weekends ago we stopped off at the Namadgi National Park visitors centre and collected maps as well as talked to the staff there as I was looking for a gentle part day walk to get my partner used to carrying a pack. Previously he was not even keen to carry a tiny pack with a water bottle and camera in it. The staff suggested the Yankee Hat walk to the only Aboriginal Rock Art located within the ACT, being only 7kms round trip. Following on from that trip, I have decided come hell or high water I want to start walking and at least doing overnights, if my partner can not or will not hack it, I will go alone. To this end I started hunting around for a light ( read able to be carried without doing my back) tent. I was bidding on a Hubba Hubba V6 on eBay for ONLY $250 which is hundreds of dollars off, sadly I missed out. Fortunately the even lighter but slightly less versatile Kathmandu Lansan Light came in at $250 ( down from $699) during the Christmas Sales and weighted in at sub 2kgs. I also managed to pick up a Mountain Designs Tasman 40 pack on sale for $65. After packing my new tent, my sleeping bag and my ground pad, there is not much room left for anything else.. I really should have got a 50L if I want to go solo. I'm torn between an #MSR Hubba Hubba or a #Kathmandu Lansan light both around $260aud. For #hiking tent ?!? Advice ?!? 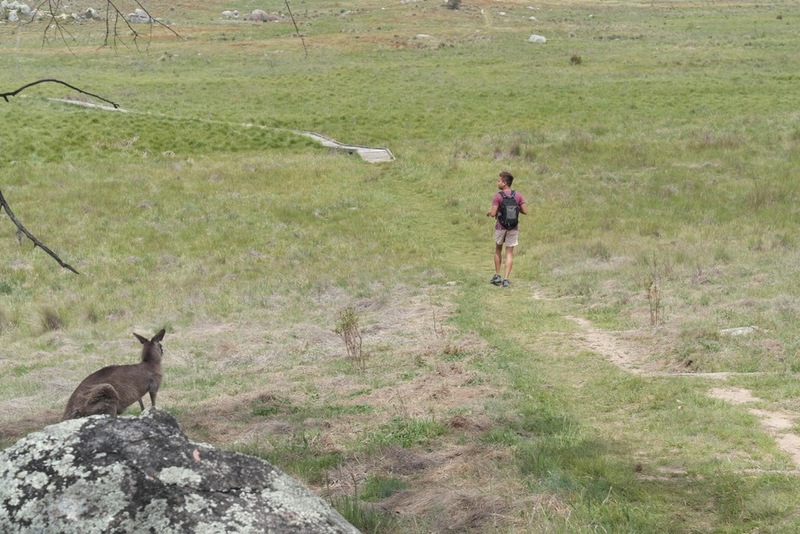 A great walk from Corin Road ( Near Corin Dam) 4 hour round trip. Just keep an eye on light conditions around winter. Effectively dark at 1630hrs. 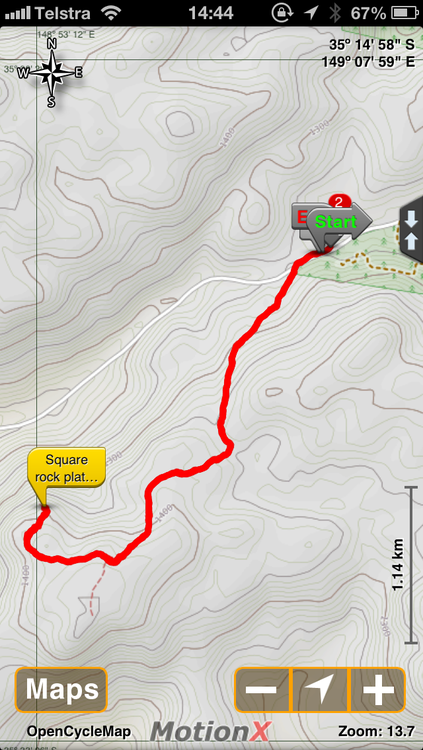 8.5 km, nicely maintained trail up to Square Rock - sheer cliff off large boulders. 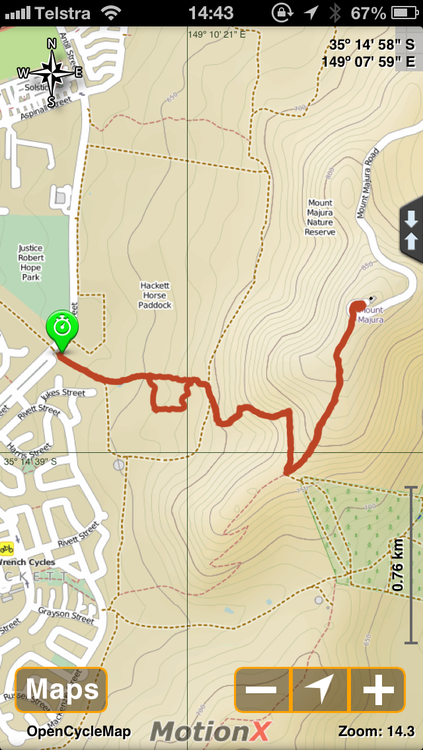 A nice day walk up Mt Majua in north Canberra. About an 1h 20m up and 30 down. Sleep but clearly marked trail.